Using a wet into wet technique, apply clean water over entire page. Starting with our lightest of values, apply Cerulean Blue and Winsor Yellow on the background area. Start to drop in the local colors of the pears. The shadow color is Cerulean Blue, foreground color is a very light background color. 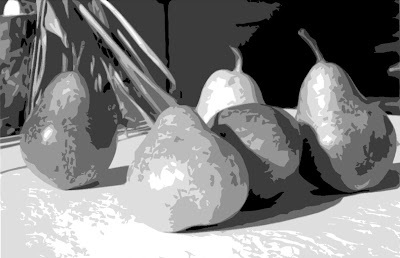 Lift out highlights on pears with thirsty brush. Clean up any edges on the pears on the table side also. Let dry. Our values will now be more middle values, more pigments, less water. Indicate the background with Cobalt Blue and Winsor Yellow. Add a little Burnt Sienna as you go across the page, more Burnt Sienna and Cobalt Blue on the right side of the page. Try not mixing the colors. Continue to show the local hues on the pears, lifting out the highlight. Light source on the right side of the fruit. Let dry. Starting at the top of the page using darker values, same pigments, repeat the same wash. While the pigment is still wet, use a credit card and scratch out some foliage shapes. Add some salt for texture. Scratch out the stems also. Use sharp edges when defining the fruits. Let dry. Go back into the fruit with your darker values and shadows. On the table top show a cast shadow with cobalt blue with a little Burnt Sienna.